Unless you've been living under a rock, or some other place without a decent wi-fi connection, chances are you've run across the sweet story of a dog named Bailey. 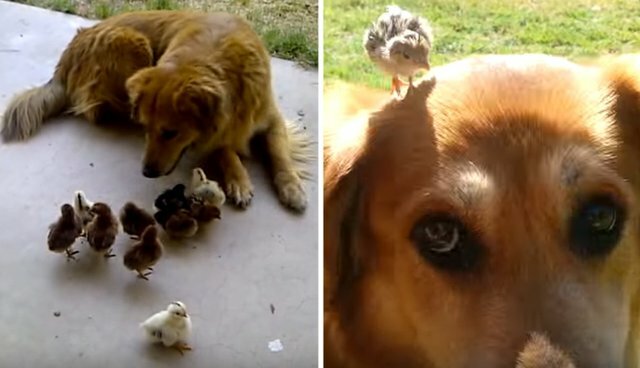 Back in 2012, her owner posted a video to YouTube showing the gentle coyote-retriever mix with a flock of 10 tiny chicks, whom she adopted as her own after discovering them as orphans. "They showed up in our yard one morning and it was love at first sight," Bailey's owner wrote under the video. Since the clip first appeared, it's been viewed millions of times across the internet - touching hearts around the world with its depictions of dogs' ever-loving nature. Last week, in a comment to the video above, Bailey's owner provided a long-awaited update on this viral story. In it, she writes that all the chicks Bailey adopted were later placed with families "who were willing to take the time to raise them, and as far as we know, they are doing well!!!" "As for Bailey, she has [since] raised an orphaned quail that my husband found (we named it Scooter). It has grew up and has left the house to hopefully raise a family of it's own. He was so darling!!!! We will post a video of this little guy when we first found him"
The Dodo reached out to the dog's owner to learn more about this incredible pet, but our request for comment was not immediately returned. Perhaps it's just as well though, as the love in a big heart like Bailey's requires no explanation.